It’s going down in T-Town! The event that started it all for GOE is back exclusively featuring Mortal Kombat 11 (Other games are welcomed as side brackets). Double elimination bracket including a “The RUN BACK” bracket for those who go 0-2! Follow the event page for more information coming soon! Join Gamestop and OKgamers.com for our Mortal Kombat 11 launch tournament! Come out to compete in this free MK11 tournament, starting at 7pm. First place wins a $25 Gamestop Gift Card, second place wins a $15 gift card. It’s Coming! HXC Gaming Events in partnership with Esports Association at The University of Oklahoma presents Super Bit Wars 7! The annual tournament held in honor of the late Forest “Solidus” Sharp! Oklahoma’s premier spring video game competition held annually. This is an event you do not want to miss. Do you have a signature Air to Air move? A BNB combo take down? Whether you’re a Scorpion, a Kung Lao or a Sub-Zero master let the Kombat begin! FlyingTee’s second Esports tournament will be another epic experience. Food and beverage specials available, so come hungry! Get your registration form in early as space is limited. Spectators welcome, minors welcome to watch if accompanied by parent or guardian. X-rays allowed, single elimination bracket, random select for maps, no abusing of unsportsmanlike mechanics. Each match is one game and one game is best of three rounds with 99 second timer. JUNE 1ST: Dual event! $50+ winning pot for each tournament! Bring your friends. The more players, the higher the prize! There will be a giveaway for spectators as well, so bring anyone who may want to watch and root for you. JUNE 2ND: Playerunknown’s Battlegrounds DUO Tournament! $100+ winning pot! Bring your friends. The more teams, the higher the prize! There will be a giveaway for spectators as well, so bring anyone who may want to watch and root for you. 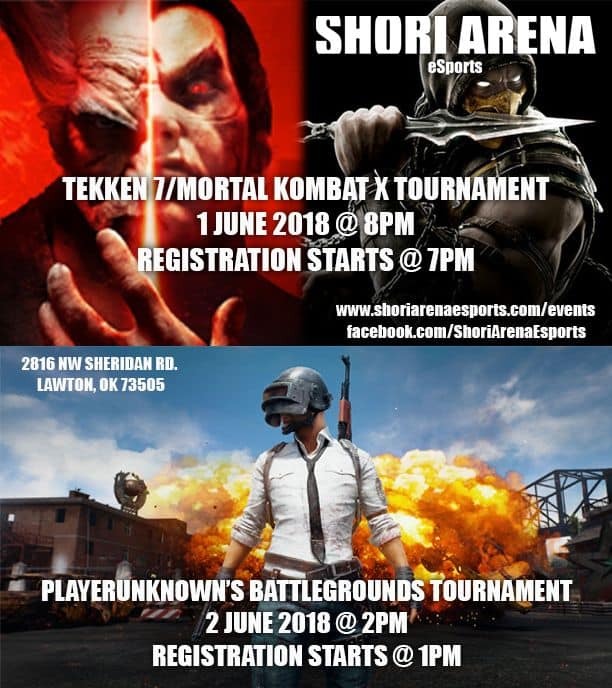 Dual Fighting Game Tournament and PUBG Tournament! JUNE 1ST: Dual Fighting Game event (Tekken 7 and Mortal Kombat X)! $50+ winning pot for each tournament! Bring your friends. The more players, the higher the prize! There will be a giveaway for spectators as well, so bring anyone who may want to watch and root for you. We here at Saadboys Inc. are pleased to announce our newest live entertainment venture ‘Send Noobs: A Video Game Challenge Show’. The video game comedy live show where contestants play vintage games blindfolded projected in front of an audience. This month we have a collection of Nintendo 64 gems that include Pokemon Snap, Mario Golf, Mortal Kombat and more. There will be prizes, suprises and a pinch of lighthearted sabatoge. Come join Heath Huffman and Christopher Fox at the 51st St. Speakeasy on Nov.16th at 8pm, audience participation extremely encouraged!